Only like to play as an AD carry? 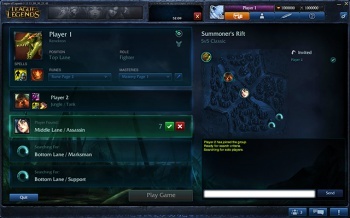 Riot will soon be trialing a new system that lets players pre-select their roles. "Solo mid or I feed." We've all encountered players like this in League of Legends, those guys that no matter what, will want to play a certain role, even if it's a detriment to the team. Well, this may be a thing of the past, as Riot will soon be trailing a new "Team Builder" system that allows players to pre-select their preferred roles. The system will allow players to pick positions (mid, top, bot, jungle), roles (tank, assassin, fighter, mage) and even specific champions, and Riot hopes it will foster experimentation in the community. "How often have you logged on to League of Legends and thought, 'I just want to play Renekton today.' Or maybe you want to try a new strategy but can't find four friends to premade with. We're always asking how we can make the League of Legends experience better, and one thing that comes up a lot is how players want to feel like they're in control of their pre-game experience." Team Builder is intended to bring players together that complement each other's expectations and intentions from the moment they enter the lobby. When everyone's aligned on who will be going where and playing what, the only thing left to figure out is how to dominate the opposition. Team Builder will initially be a completely separate queue from every other League of Legends queue. "We're looking forward to feedback from players and will use that feedback to determine whether this type of Champion Select is a good fit for modes like Ranked Mode," said Riot, "But for now, we're focused on improving the Champion Select experience as an independent queue experiment." Along with Team Builder, Riot will be rolling out a more advanced matchmaking system that "can dynamically account for your experience with a given role, position or champion."